Only 42 percent of U.S churches provide the ability for people to give online, according to a recent Dunham+Company / Campbell Rinker study. That number plummets to 29 percent of U.S. churches with less than 200 in attendance offering an online giving option to their congregation! E-commerce has been online since 1994 and online giving capabilities have existed since pre 2000. Meaning, churches have had at least 15 years to bring giving online. Churches have had 15 years to get giving online! And only 42 percent of them have online giving capabilities today. To the 42% of churches doing online giving, hats off to you! Hopefully this post gives you some ideas and tips to improve a bit. To the 58% of churches that don’t offer online giving, for goodness sakes, please put it in your plans for 2016! 🙂 It’s time. In fact, it’s time to put online giving in place and some form of mobile giving for you church. With that in mind, here are a handful of really practical tips along with some great examples that will help your church boost online giving adoption and results. You probably spend a lot of time driving people to your website, but we all know that visits don’t equal gifts! Once people are on your website, it’s important that you draw their attention to your “give” button. 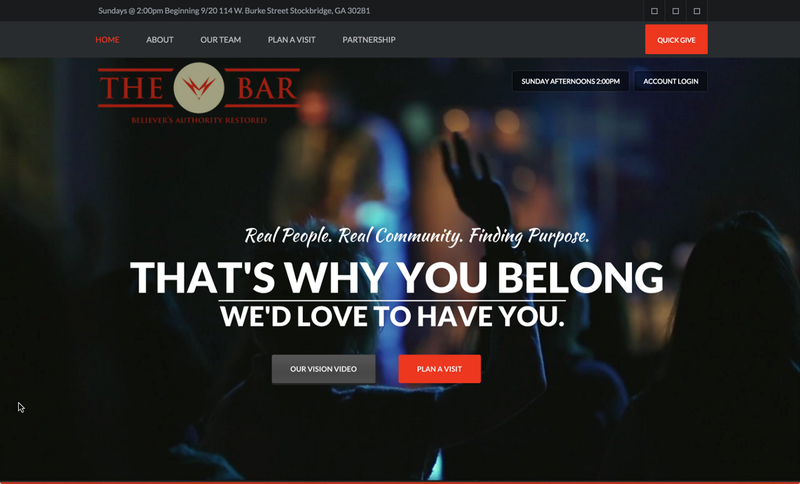 Take The BAR church for example. When you land on any page of their website you’ll fairly quickly notice the big, red button that says, “Give Online”. Take note of this best practice. Make you give button noticeable by putting it in a prominent location, giving it a color that stands out and labeling in such a way that it tells people what it does when they click on it. 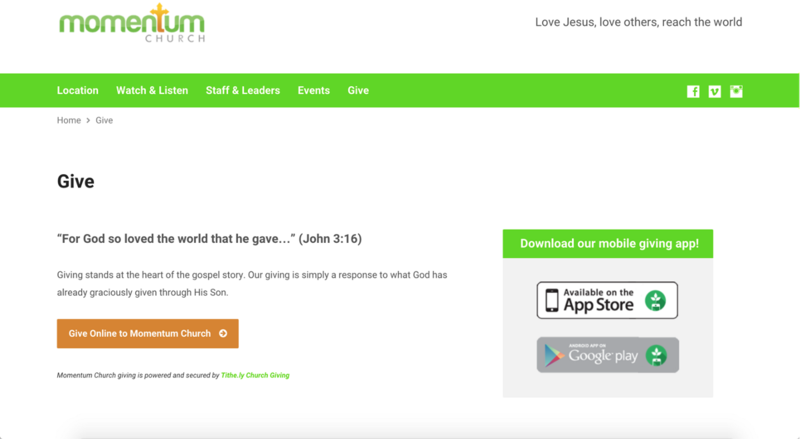 Do you know if your church giving pages works on a mobile device? Not just the display of the content, but everything from the initial view and content all the way through a person making a gift and getting to the confirmation page. 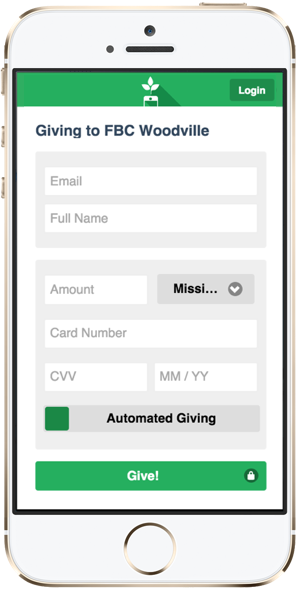 First, go through the process of making a donation to your church from your iPhone or Android phone. How’d it go? Second, if you’re using a website analytics tool like Google Analytics, jump in to see how much of your web traffic is coming from mobile users. Here’s a quick video to show you how. After you’ve looked at overall mobile traffic on your website, narrow your analysis down to your giving page. Make sure to set the date range back a year or two, so that you can look at the trend over time. You’ll likely find that mobile traffic to one of the most important pages on your website has grown significantly. Mobile traffic has surpassed desktop traffic for most people so it’s critically important that your church giving page works flawlessly on every type of mobile device. We like to “see” what we give our money to. That’s why online stores use lots of product images and why brick and motor stores will never die. People want to see, touch and smell what they are buying. Check out how FBC Woodville does it. They keep things simple, all while doing a great job of helping people “see” the vision. Be sure to take a play out of their playbook when implementing your church giving page and use at least one compelling image. The added benefit is that if your website is built well this compelling image will be shared on social media when people tweet, post to facebook, etc! Giving to your local church, your spiritual home, is so much more than buying something online or making a donation to your favorite nonprofit. It’s based on a deep connection and a biblical conviction. It’s important that you, as a church, communicate your heart and vision for all those financially supporting you to see. Keep in mind, you don’t have to write a thesis to effectively do this. Take a Momentum Church. It’s simple and to the point, but they’ve done a great job quickly articulating the heart of giving along with their vision for how those funds are to be used. Building your brand as a church is tough. It takes hard work, strategic thinking, time and persistence — not to mention, money. Which leads me to wonder … why would you send people off of your website to a third-party site to give their financial gift? Today’s technology allows you to easily use great online giving tools while also keeping people on your website. Let’s have a look at the standard donation process of PayPal vs. Tithe.ly. The user wants to make a donation and clicks on the “Donate Now” button. They are redirected to the PayPal page, leaving your church’s website all together. They are asked to sign in to their PayPal account or (if they can find it) enter their bank details. The user confirms that they are authorizing the payment. They are redirected back to your website (hopefully). 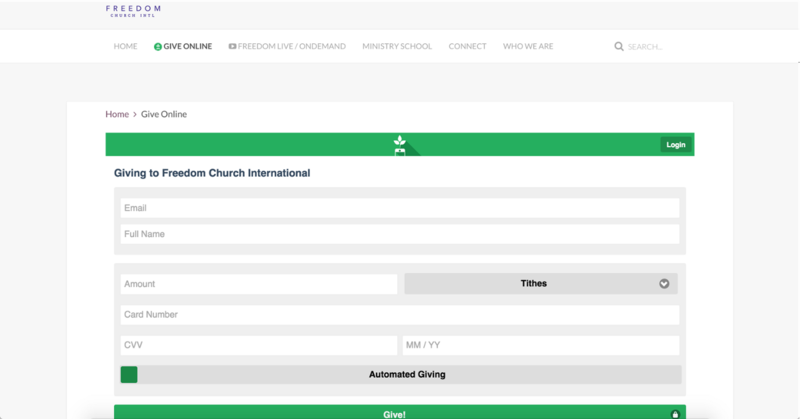 The user wants to make a donation and clicks on the give button from your church website. 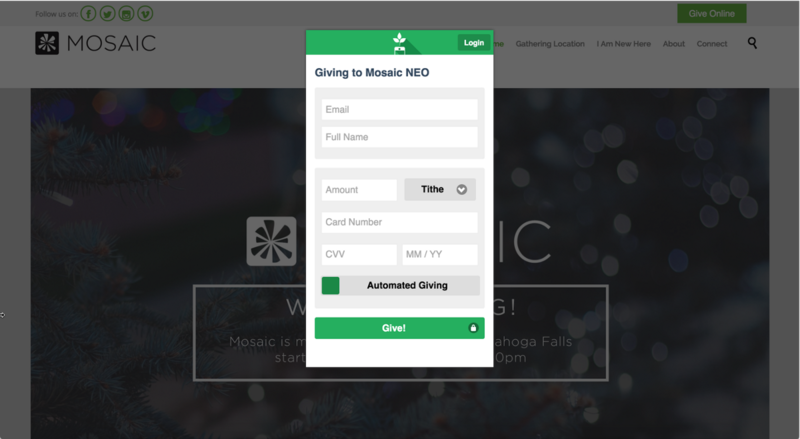 A modal (aka lightbox or modern day web popup) window opens right on the page, keeping the user on your church’s website, where the user enters their gift details or logs in. They confirm the payment and get confirmation right there. As you can tell, based on the numbers of steps (5 for PayPal vs. 3 for Tithe.ly), it’s a much better experience for the giver using Tithe.ly. Tithe.ly takes less steps and keeps donors on your church website the entire time! Most church websites have a lot going on: Top navigation, search tools, email opt-ins, side bar navigation, ads highlighting programs, promotions for events, service times and locations, and much more. 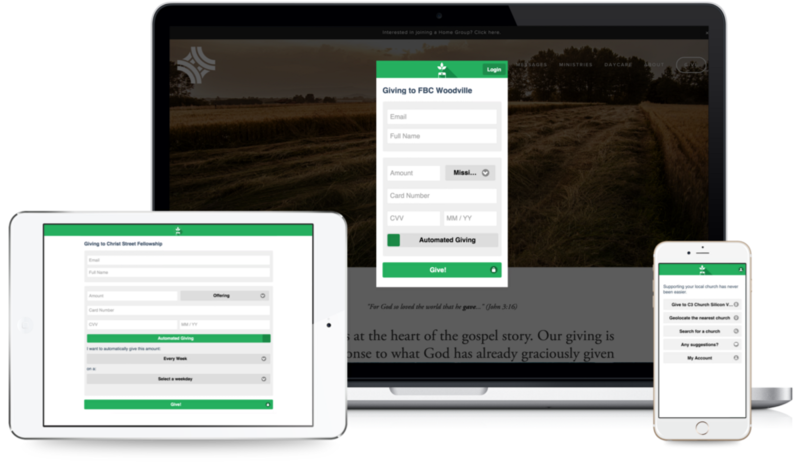 When someone lands on your church giving page, they should see and experience a page that is simpler than the rest of your website — one that makes completing the action of donating easy. Let’s keep things simple on our church giving page! People don’t like to give away information for no reason or waste time filling out long forms. Be sensitive to these dynamics in online giving and make sure to limit your giving form to ONLY what you need. At Tithe.ly we’re hyper sensitive to the short attention span of website visitors. If you look at any church using out web giving tools you’ll notice one common theme — we never ask for info we don’t need to complete an online donation. We require six fields and have a few that are optional in case someone wants to give monthly. That’s it! four of those six are required to process a credit or debit card and the other two, name and email, are required for us to properly issue a receipt and keep record of the gift. Getting a one-time gift is great, especially if that gift is a big one. Support by super consistent givers who have a conviction and hear give weekly is awesome. In fact this type of giving is the lifeblood of most churches financially. The problem with both of those situations is that they relies on humans … and we all know that humans are not perfect. We forget the checkbook. We go out of town on vacation. We get sick. We have to take a business trip. We don’t feel like driving through the rain, snow, wind to get to church. You get the picture. There are lots of reasons that someone might not give on a particular week. Alternatively, if you encourage members to setup automated recurring giving on a weekly basis … even the most dedicated givers will likely give more consistently while those who give sporadically will all of a sudden turn into some of your most consistent! Increased monthly revenue and made it more predictable. Improved the odds that the people giving in this manner will continue to give consistently over a long period of time. Make sure you offer a super simple way for your church to set up automated weekly or monthly recurring giving! You’ve got a great opportunity immediately after someone has given. They’ve made a decision to invest in the mission and vision of your church and they’ve pulled out their wallet to do so. Take note of Jay Kranda, Saddleback’s first full-time Online Campus Pastor, who put together a great video outlining how you can use a very low cost email tool called MailChimp to automate the process of on-boarding someone. His particular focus is on discipleship, but the concept of sending someone a series of email after they’ve given in order to help deepen the connection is a great idea! Hopefully the tips above have given you some new ideas and/or sparked thoughts on how you can improve your churches online giving efforts. I’d love to hear back from you. Which tip was the most useful to you?